Posted on Sat, Jan 21, 2012 : 5:52 a.m. This week hundreds of protesters descended on Gov. Rick Synder's neighborhood to protest his emergency manager law. At a December University of Michigan Board of Regents meeting, protestors from the Occupy Ann Arbor and Occupy U-M movement interrupted proceedings. Those same protestors rallied against the economy at an Eric Cantor speech outside the Michigan League in October. In September, another regents meeting was the scene of a U-M Professional Nurses Council protest over negotiations with the university. In short, it's been a protest-heavy couple of months. Protests, however, have a long history in Ann Arbor and U-M. We sifted through some photo archives and picked a few images of past rallies. University of Michigan students march during a June 1969 anti-war rally. More than 1,000 U-M students and local Ann Arbor residents marched down South University on a June evening in 1969. The students camped out in an area of South University, turning it into a 'People's Park,' but on the third night police officers responded to rock-throwing by using tear gas and nightsticks, according to an Ann Arbor News article. University of Michigan students interrupt a class in 1969 in an act of protest. In this September 1969 image, about 70 U-M students interrupted two ROTC classes at the university in protest, but left when ordered to do so by a professor. According to an Ann Arbor News article, Robben Fleming, U-M president at the time, threatened to take criminal actions against students if the disruptions continued. University of Michigan students carry a peace dove in protest of the war in Afghanistan. 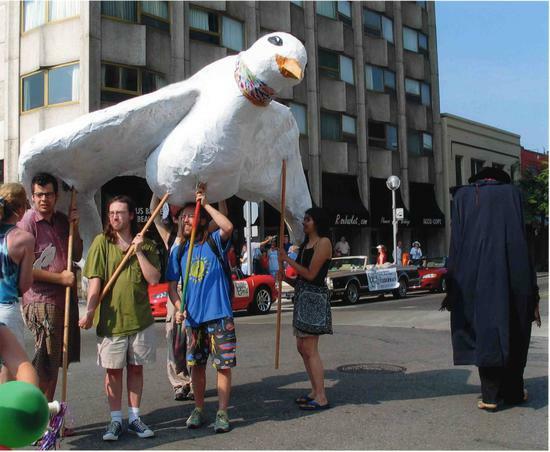 In this July 4, 2003, photo, University of Michigan students carry a large dove to symbolize their desire for peace. 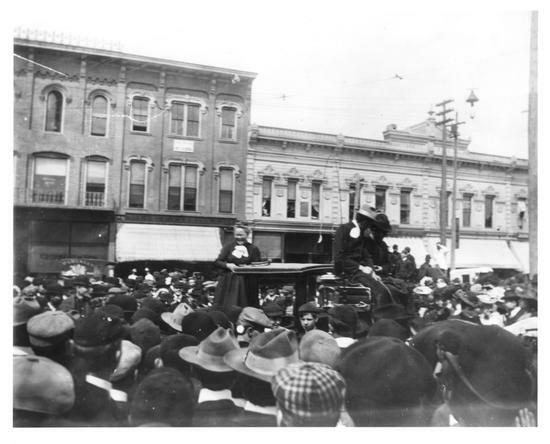 In this Ann Arbor News photo, hundreds of U-M students showed up to protest a speech, given at State Street and North University, by prohibitionist Carrie Nation in 1902. This April 21, 1972 Ann Arbor News clipping outlines one of many protests and rallies held by U-M students objecting to the war. An earlier version of this article incorrectly identified the origin of the first photo. It is from the John and Leni Sinclair Collection at the Bentley Historical Library. Sat, Jan 21, 2012 : 10:06 p.m. Reminds me of the Marlon Brando movie, &quot;The Wild One.&quot; &quot;What are you rebelling against Johnny&quot;? &quot;Whaddaya got&quot;? Sun, Jan 22, 2012 : 1:03 a.m. I can think of one thing to protest against, Mitt Romney paying 15% while I pay 30% or more in income taxes. Sat, Jan 21, 2012 : 9:16 p.m. Sat, Jan 21, 2012 : 9:15 p.m.
Tue, Jan 24, 2012 : 10:58 p.m.
ron pau;ls msg has the right GOAL.. but we can;t get there in one-great-leap-forward. it takes lots of tug boats a while to steer teh ship to the right dock. Sat, Jan 21, 2012 : 9:25 p.m. Sat, Jan 21, 2012 : 8:53 p.m. They are naive. Always rally to some cause . Why don't they protest the ridiculous high tuition and the salaries of bureaucrats at U of M? Sat, Jan 21, 2012 : 8:47 p.m. The article dated April 21, 1972 references the Human Rights Party. It is unfortunate that the party dissolved since it had enough influence in Ann Arbor and Ypsilanti to field and get elected a number of City Council candidates. Kathy Kozacheff became the first openly lesbian person elected to any public office in the United States when she was voted in as a City Council member in Ann Arbor in the early 1970s. Eric Jackson, also of the Human Rights Party, was elected to Ypsi City Council in 1974 and sat as a councilman in that city for four years. They can be credited with pushing the politics of the Democratic Party, and of the cities of Ann Arbor and Ypsilanti, to the left during that era. Some of the left wing U-M activists of the 1960s, like Alan Haber and David Goldstein, are still around - but most are long gone. Sun, Jan 22, 2012 : 3:20 a.m. Sat, Jan 21, 2012 : 7:44 p.m. I might add that these comments again prove that Ann Arbor is not a &quot;liberal&quot; hotbed---anymore than Jackson Tennessee, Topeka, or Lubbock are. If you want anything at all left of Glenn Beck, you must go to Canada or perhaps farther. Sat, Jan 21, 2012 : 7:38 p.m. Sat, Jan 21, 2012 : 5:51 p.m. The Leftists can protest and gather groups of people to force CENSORSHIP on anyone/anything they disagree with. If you don't agree with a liberal they say your discriminating and call you an idiot &amp; mock you. It can't possibly be because you have a difference of opinion, it's not about facts, stats, truth or reality. It's because they have deemed certain topics closed to debate. Now a days if you disagree on complex issues or certain behavior and peoples lifestyles your discriminating against them or your a bad person. Why can't it be that you just don't agree with it or you don't personally like it? Whos to say your right or the other side is right. It seems as though the left practices selective censorship. Liberals seem to think it's unacceptable to disagree. Sounds self righteous to me. Sun, Jan 22, 2012 : 2:28 a.m. Sat, Jan 21, 2012 : 11:56 p.m.
@ERMG: Excellent points. I was in law school decades ago when it was debated whether or not gays should be given the &quot;top-tier&quot; strict scrutiny analysis when determining whether or not the Equal Protection Clause of the Fourteenth Amendment was violated by the government. That was typically reserved for racial minorities. Blacks and gays have arguably many similar characteristics for purpose of constitutional inquiry - an immutable characteristic, a history of persecution etc. I will disagree that most conservatives want to intrude on lives of Americans. The GOP rank-and-file, at least in Michigan, is predominantly libertarian in orientation and supports gun ownership rights and restrictions on law enforcement powers. Good night and good luck. Sat, Jan 21, 2012 : 10:07 p.m. I could easily replace every instance of &quot;liberal&quot; in your post with &quot;conservative&quot;, and find a large percentage of the population who would agree with it. Sat, Jan 21, 2012 : 8:49 p.m.
Censorship? Really?? President Nixon told the country, in 1970, that the U.S. was not bombing Cambodia, when we Leftists KNEW it had been happening. You could blame us for our fanciful, self-fulfilling, rhetoric --- except, we were telling the truth. Or, in 1953, the CIA secretly and surreptitiously ousted the democratically elected prime minister of Iran ... followed by the U.S. government's ardent support of the shah of Iran's dictatorship for the next 25 years. (And we couldn't understand why Iranians later would later take U.S. citizens hostage.) For 30 years the Left howled for awareness of the truth, but we were discounted and denounced. It seems more like the administration was trying to practice censorship - of the truth. Sat, Jan 21, 2012 : 7:48 p.m.
&quot;Liberal'&quot; ( which i am proud to be) means tolerant of other points of view that arent patently anti-factual ( e.g. climate change denial, creationism) or just plain irrationally cruel ( e.g. homophobia, as in denying gay citizens the right to marry) . While fools like these are mostly found on the far right, the far left has it's own versions with their own irrational obsessions , mostly around certain foreign policy issues and excessive enthusiasm for certain kinds of incendiary obnoxious- for- its -own sake free speech.. ( check out the corner of 2000 washtenaw on any sat morn between 9-10). And then there's ron paul who combines the worst of both. Sat, Jan 21, 2012 : 7 p.m. Liberals are getting increasingly hateful imho. Sat, Jan 21, 2012 : 5:25 p.m. The protesters left a big mess behind in the R. Snyder neighborhood. C'mon folks, what the heck. Sat, Jan 21, 2012 : 8:24 p.m. I bet every one of the protestors will go back and clean up the mess they left in the rich neighborhood, if Snyder et al will go back and clean up the mess they are leaving in the poor - and now middle class - neighborhoods. Sat, Jan 21, 2012 : 7:43 p.m.
Did you really expect them to clean-up after themselves ? The entitlement mentality doesn't work like that ! Not in their job description. Sat, Jan 21, 2012 : 5:07 p.m.
Why you continue to glorify a handful of misguided students and extremist liberals is bewildering. For example, I was an engineering student in the sixties and the vast majority of students were busy studying and learning to be adults. However, the media only produced headlines of activists blowing up phone booths. Please try to represent the majority in your reporting with as much emphasis as these radical few if you ever want to be viewed as anything but &quot;tabloids&quot; like the National Inquirer. By the &quot;vast majority of students&quot; do you mean all the white males in your engineering classes? Oh, if only I had accepted my place in this world I could have earned that degree in home economics. Sat, Jan 21, 2012 : 8:41 p.m.
&quot;extremist&quot; and &quot;liberal&quot; are antithetical terms. Liberals are moderate, albeit a bit left of center and generally pretty well informed . Extreme leftists and extreme rightists are neither ....although sadly the latter now seem to be the majority of a major political party ( guess which!!) while the former remain fringe crackpots to pretty much everyone.. Sat, Jan 21, 2012 : 8:22 p.m.
And where would we be with the 'radical few' - the conscience of our country? oh, yeah, going to war again and again; dying and killing in Iraq and Afghanistan. What's unfortunate is that they (we) were (are) indeed too few. Sat, Jan 21, 2012 : 6:59 p.m.
&quot;I was an engineering student in the sixties and the vast majority of students were busy studying and learning to be adults.&quot; And enjoying your student deferments while the poor folks were drafted and fought. Sat, Jan 21, 2012 : 5:03 p.m. Protests of today are so dissappointing, there is no music to reflect the sentiment of today's messages. The 60's and 70's had the best music. Sat, Jan 21, 2012 : 4:46 p.m. Bunch of rich kids who have been brain washed by liberal professors with nothing better to do. When I was in college, I worked full time and didn't have time to wine about everything that upset the libs. Sat, Jan 21, 2012 : 9:40 p.m. When you associate with those who spit on soldiers, you become one of them. Thank you for refraining from hocking the loogie. I for one say thank you to the service men and women who protect me and speak with my vote. Sat, Jan 21, 2012 : 6:56 p.m. I was here in Ann Arbor protesting. I was not rich. I was not even in college. I was working full time because I had to support myself. I was also sick of the damned war and the people who sent my friends, relatives and neighbors to fight it while they lived high on the hog in Washington. I wasn't whining. I was demanding that they end the killing of over 59,000 American soldiers as well as Vietnamese. I never spit on a soldier or blamed them for going. Most were drafted. Many were black and poor. The kids who had money could get educational deferments or cop out in the reserves because their rich folks had ties. Aw..forget it. Sat, Jan 21, 2012 : 4:41 p.m. Sat, Jan 21, 2012 : 7:02 p.m. Sat, Jan 21, 2012 : 5 p.m. These photos kicked off a nostalgia fit. I'm having a flashback to Students Wildly Indignant About Everything and to other Li'l Abner strips with overly buxom beauties (and Al Capp's public apologies for them). This is more fun than surfing the internet! More old Ann Arbor photos, please. Sat, Jan 21, 2012 : 3:56 p.m.
Memory correction: Students Wildly Indignant about Nearly Everything. Oh, I get it now. Sat, Jan 21, 2012 : 3:32 p.m. These young people are patriots, unlike the majority of apathetic video game slackers today, these people were willing to speak truth to power and put their lives on the line for their politics. Cue the dirty hippie commenters. Sat, Jan 21, 2012 : 5:42 p.m. Sat, Jan 21, 2012 : 4:48 p.m.
&quot;put their lives on the line for their politics.&quot; Wow, put down the weed. I don't think anyone (or very very very few at least) has ever put their life on the line in this country at a protest. I would use the word, &quot;patriot,&quot; but they had a somewhat legitimate beef. Sat, Jan 21, 2012 : 3:28 p.m.
@Jeff Renner - Thanks so much for the information and link. That picture from 1902 is wonderful, including the captions. I never knew that the building that Espresso Royale is in is so old. I will look for the picture placard this weekend. The article was good, too! Sat, Jan 21, 2012 : 1:46 p.m. In 1902, 1000 students attended a rally by prohibitionist Carrie Nation at State St. and N. University, but they were not sympathetic. Local historian Wystan Stevens has a photo and a newspaper article from the time at <a href="http://www.flickr.com/photos/70251312@N00/1811490489/" rel='nofollow'>http://www.flickr.com/photos/70251312@N00/1811490489/</a> If you hover your cursor over parts of the photo you can see Wystan's captions. Tue, Jan 24, 2012 : 10:48 p.m.
great link - outta be part of a2 hs curiculum - localized history fascinates. Thanks for the laugh Jeff ! Thanks for the research Wystan ! The children at A2.com's idea of in depth is to pulll up black and white photos from 1969 and portray that as ancient history. On second thought, I guess for them it is ! Again thanks for helping them along for our benefit. Sat, Jan 21, 2012 : 3:36 p.m.
Jeff - Thanks for sharing the link. I was wondering where the photo of Carrie Nation was taken. And a big thanks to Wystan for annotating the photo. It's neat to see how things have changed in the past 110 years.